The PSL Rheotek RPV-1 (4) four position Pulp and Cellulose viscometer system is suitable for measuring a wide range of pulp and cellulose products including bleached wood (paper pulp), bleached chemical pulp, digester samples, cotton linters, regenerated cellulose, aged electrical papers and pharmaceutical bulking materials. 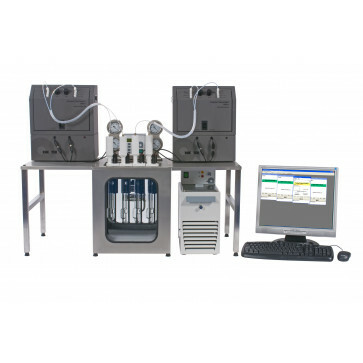 RPV-1 Pulp & Cellulose viscometer systems are configured with a unique nitrogen purge system in order to ensure that samples are protected from oxidation during both the sample preparation and viscosity test. The RPV-1 Pulp Viscometer is designed to be integrated with the iSP-2 Pulp Sample Preparation system for pulp & cellulose. Other options include Pulp stirring block and RSS Rheotek Smart Sampler. Please e-mail to info@psl-rheotek.com for a quotation. The RPV-1 Pulp & Cellulose viscometer automates the manual steps set out in standard methods, minimizing the variability of results. Systems can be configured with 1 to 4 measuring positions. Other options include sample preparation, sample agitation and auto sampler. Flow times are measured automatically using ASTM Ubbelohde viscometer tubes supplied with ISO 17025 certificates of calibration. Cleaning is carried out in-situ utilizing solvents and a safe vacuum system. The comprehensive RPV-1 software program records all measurement data as well as calculating a wide range of results including relative viscosity, intrinsic viscosity (Limiting Viscosity Number), degree of polymerization (DP), K value, kinematic viscosity (mm²/s) and dynamic viscosity (mPa.s). PSL Rheotek Polymer Viscometer – four positions complete with viscometer bath, chiller, control module, nitrogen purge system, two measuring heads, two filling stations, PC control system and PIAB vacuum system.